Corum Admiral’s Cup Challenge 48 Black Flag was published in 2008, it is an old watch and the China watch industry just released its replica version. Before introducing this replica Corum watch, let’s read the background of Corum Admiral’s Cup first, it is a sporty watch that features a distinctive 12-sided case, the name of Corum Admiral’s Cup comes from a famous international regatta, Admiral’s Cup is the most iconic series of Corum. Genuine Corum Admiral’s Cup Challenge 48 Black Flag is made of Titanium and its case is measured to be 48mm in diameter, it is equipped with co-753 caliber. 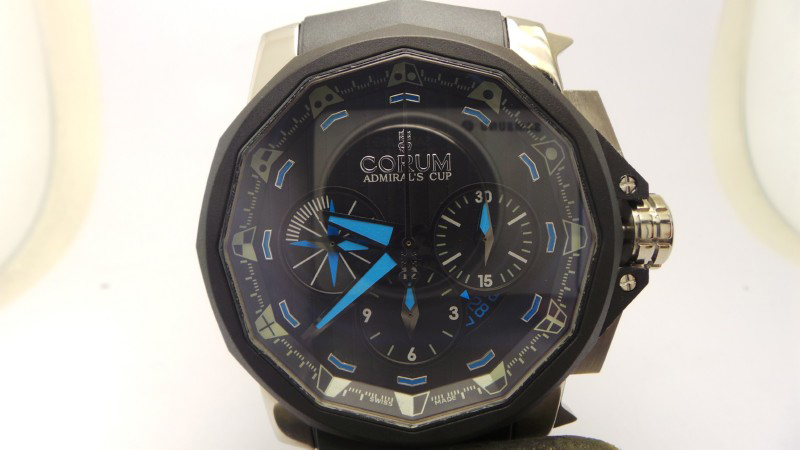 After reading the information above, you should have a little knowledge about Corum Admiral’s Cup, so let’s talk its replica now. 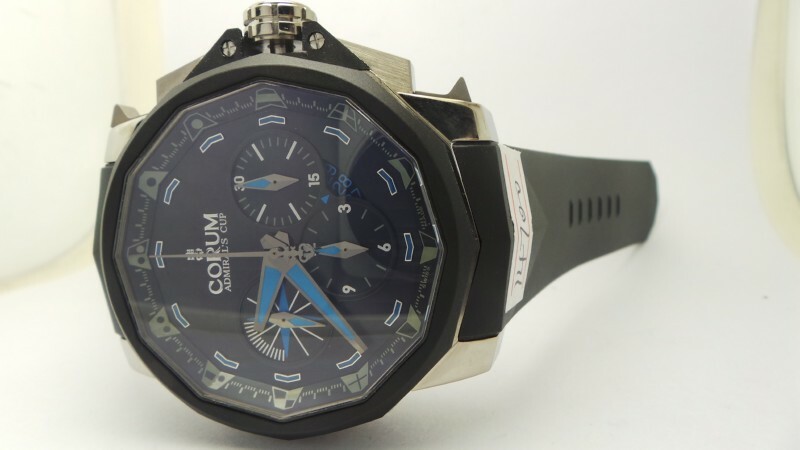 This Corum Admiral’s Cup Challenge 49 Black Flag replica watch is the best Corum imitation watch that has ever been made, the replica is made with genuine watch that is fully torn down, so its case has the 1:1 construction, just the same as genuine, all its components could be completely exchangeable with genuine Corum Admiral’s Cup. 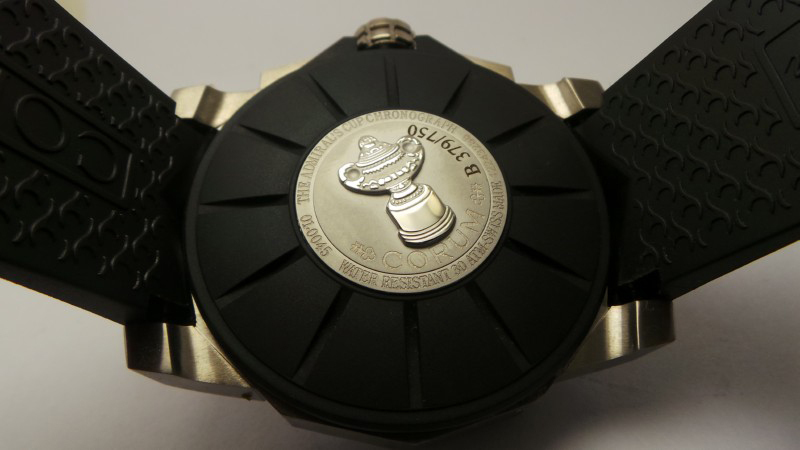 Sandblasted finish on Titanium case that is black DLC processed, the replica watch is made of solid Titanium so that it weighs almost the same as genuine, besides, Titanium case can prevent the watch from scratches. Black dial has all correct information, blue hour markers and hands that are coated with blue lume materials. You can read the date from the window at 4:30, by the way, you can adjust the date via a recessed pusher at 10:00. The rubber strap is not like Hublot rubber straps, it is anti-dust, it will be very clean even you wear your watch for a long time. 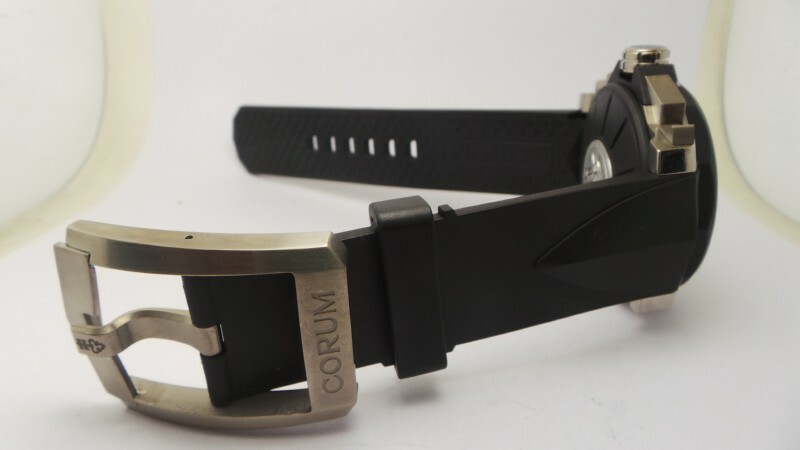 From the case back of Corum Admiral’s Cup Challenge 48 Black Flag watch, the logo is three-dimensional, about the clasp, it is also in high quality, brushed finish with deep “CORUM” engraving, you can clearly feel the engraving depth by hand. The replica Corum watch is equipped with an Asian 7750 Valjoux Chronograph movement, which has a functional regulator and beats 28800 times per hour. 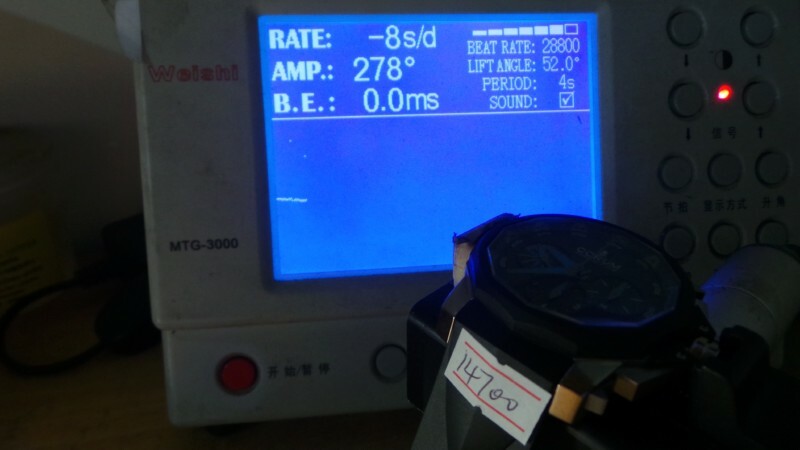 Check the movement testing result above, the picture says this watch is only 8 seconds slower each day, not too many chronograph replica watches can do that accuracy.